Duncan was born in 1957, at the dawn of the space age, to John Everett McRee, an artist and Southern gentleman and Joan Kilburn, a leader in special education and Montana cowgirl. Duncan was born in San Francisco and grew up in Mill Valley California on the slopes of Mount Tamalpais. He did his B.S. work at the University of California at Davis and recieved his Ph.D. from Duke University. At UC Davis he met his wife, Janice Yuwiler and they now live in San Diego with their children, Alex, Kevin and Alisa. Practical Protein Crystallography is a popular book for advanced students studying the art of protein crystallography that I co-authored with Peter David. It is meant for anyone who wants to actually solve and analyze protein structures and includes lots of hands-on tips and guidelines. There are plenty of other books on theory so this book only covers theory where it actually helps to get the job done. It features the software I wrote, XtalView. The book is currently in its second edition. (Shameless commerce stuff: Click on the book at left to go to Amazon.com.) Our editor keeps trying to get us to do a third edition, but I can never seem to find the time. How I found time to do the first two editions is a total mystery to me. For the second edition Peter kindly helped me; for the third edition I will probably need a ghost-writer. My company for model railroad electronics. I make "Frog Juicers" for providing power (juice) to frogs (where two rails come together on a railroad). The frog juicer can automatically reverse the frog power as needed. 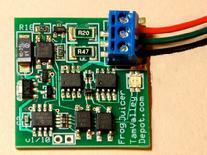 I also make servo drivers so you can use powerful, small and cheap R/C servos to drive your turnouts and animate signals, etc. Click on the picture to visit Tam Valley Depot. On the left is my cute frog juicer logo. I made the logo partly to correct the erroneous image some people had that a frog juicer was a way of extracting juice from frogs when in fact it is for keeping frogs well-juiced and happy. On the right is one of my frog juicer boards. We make them right here in San Diego. Kevin, 15. He's an accomplished actor, game-designer and drummer. Alisa (in front), Age 10. She is the cute one in the family, very popular and has an artistic eye. Janice, my wife. She is a writer of children's books and an expert in public health, specifically childhood safety. Alex, 18. Alex is a special child. He can't talk but he knows how to relax and enjoy life better than any of us. I find my chief expression as an artist in the form of model railroading. I enjoy re-creating the beauty of the natural and the man-made worlds and preserving history in the form of the Tamalpais Valley Railroad. These are definitely not "toy trains". The layout runs through the three bedrooms of our house. One of the terminii is located in the master bathroom. 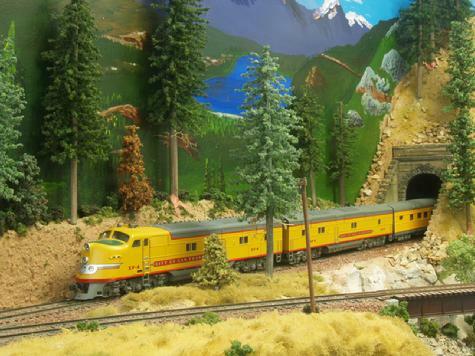 Click on the picture to see more pictures of the TVRR layout as it climbs from the waterfront of Sausalito, over the Sierras, descends along the Truckee River and pushes on through the Nevada desert. Another hobby of mine is photography. My dad was an artist and naturalist and my mother was an avid outdoorswoman, so I developed an appreciation of montains and nature. This is a picture of some tall grass stalks that I found on a hike in the Santa Monica Mountains. I also took the banner photo of Half Dome in winter at the top of the page. Half Dome is a total cliche but it is still the coolest mountain peak anywhere. My current camera is an Olympus E500, a digital SLR. I have totally embraced digital photography - no more film for me. SLR's are the best because they make a satisfying click sound as the mirror flips up that tells you have taken a picture. I have a soft spot for Olympus as my first real camera was the now classic OM1. Alas, that camera was stolen by someone touring our previous house when it was for sale. A winter picture taken in Yosemite Valley with lots of swirling clouds. I am a former member of Vistage, formerly known as TEC, that brings leaders of companies together with other leaders to help them make better decisions and to give them a forum for learning about business and leadership principles. My group leader is the remarkable Mark Fackler, who beides leading Vistage groups also runs TKF, a non-profit organization dedicated to stopping kids from killing other kids. Closed on May 31, 2009 by order of its Japanese masters. I was the President for 4.5 years. We solved protein structures for hire for about 30 different pharmaceutical and biotech companies. Syrrx was founded in 1999 by Ned David, Ray Stevens and Peter Schultz and built an awesome structural biology pipeline. I was Director of Crystallography and New Technology there until 2003 when I left to start ActiveSight. My group solved hundereds of structures and pioneered high-throughput protein crystallography now used widely around the world. Syrrx was bought by Takeda in 2004 and is still in La Jolla now solving structures for Takeda. Rumor has it the DDP4 inhibitor drug Syrrx invented will be approved any day now.